, count d'Abrantes, a Portugueze, was the first governor of India, to which place he was dispatched in 1505, by king Emanuel, with the high character of viceroy. His fleet had a dangerous passage out, and almost continual storms off the Cape of Good Hope, without being able to make it, but at last reached Quiloa. The king of that place having given some cause to suspect his conduct, Almeida resolved to besiege the city, and after landing 500 men, the natives fled, and the Portugueze entered and plundered it. The plunder was however deposited in one house, and shared among the soldiers, Almeida taking as his own share, only one arrow. He then began to build a fort, and offered the people the protection of the Portugueze, which they accepted, and received a king from them, who promised to be obedient to king Emanuel. 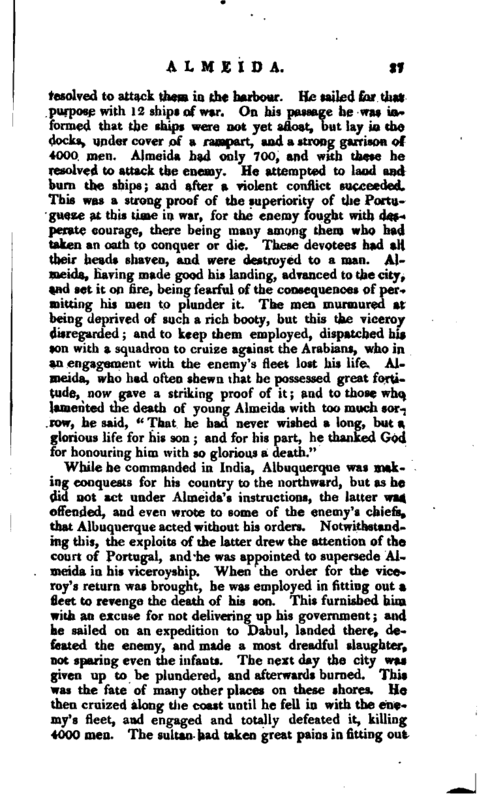 From hence they sailed to Mombassa, and immediately attacked that place. A shot from the Portugueze set fire to the powder magazine, which so terrified the inhabitants that they abandoned the fort. Having caused the port to be sounded, and finding water sufficient, he entered the hacbour, and then sent a message to require the king to submit himself to the king of Portugal; but the messenger was refused admittance. Almeida then endeavoured to seize some of the natives, and took prisoner a domestic of | the king, from whom he had intelligence that the king had received into his pay 4000 auxiliaries, and expected more. On this intelligence he resolved to besiege the place; and set fire to a part of the city. The natives attacked the Portugueze, although at the same time employed in extinguishing the flames; which however proved their best friends, and obliged the enemy to retire. Next day, when the flames abated, the Portugueze again entered the city, and were much annoyed by the narrowness of the streets, and the darts of the enemy flung from the houses. 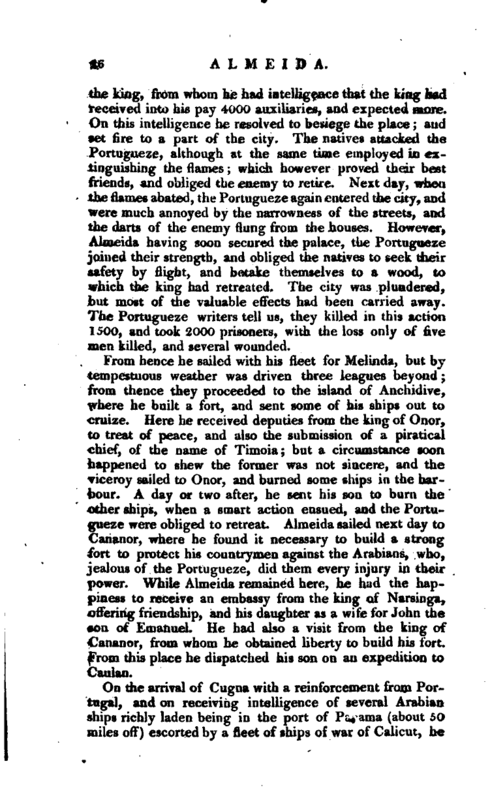 However, Almeida having soon secured the palace, the Portugueze joined their strength, and obliged the natives to seek their safety by flight, and betake themselves to a wood, to which the king had retreated. The city was plundered, but most of the valuable effects had been carried away. The Portugueze writers tell us, they killed in this action 1500, and took 2000 prisoners, with the loss only of five men killed, and several wounded. From hence he sailed with his fleet for Melinda, but by tempestuous weather was driven three leagues beyond; from thence they proceeded to the island of Anchidive, where he built a fort, and sent some of his ships out to cruize. Here he received deputies from the king of Onor, to treat of peace, and also the submission of a piratical chief, of the name of Timoia; but a circumstance soon happened to shew the former was not sincere, and the viceroy saited to Onor, and burned some ships i:i the harbour. A day or two after, he sent his son to burn the other ships, when a smart action ensued, and the Portugueze were obliged to retreat. 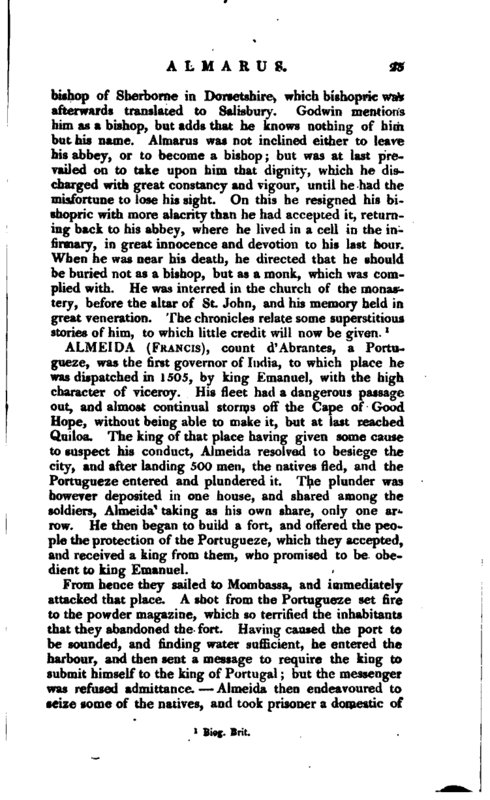 Almeida sailed next day to Cananor, where he found it necessary to build a strong fort to protect his countrymen against the Arabians, who, jealous of the Portugueze, did them every injury in their power. While Almeida remained here, he had the happiness to receive an embassy from the king of Narsinga, offering friendship, and his daughter as a wife for John the son of Emanuel. He had also a visit from the king of Cananor, from whom he obtained liberty to build his fort. From this place he dispatched his son on an expedition to Caulan. While he commanded in India, Albuquerque was making conquests for his country to the northward, but as he did not act under Almeida’s instructions, the latter was offended, and even wrote to some of the enemy’s chiefs, that Albuquerque acted without his orders. Notwithstand-. 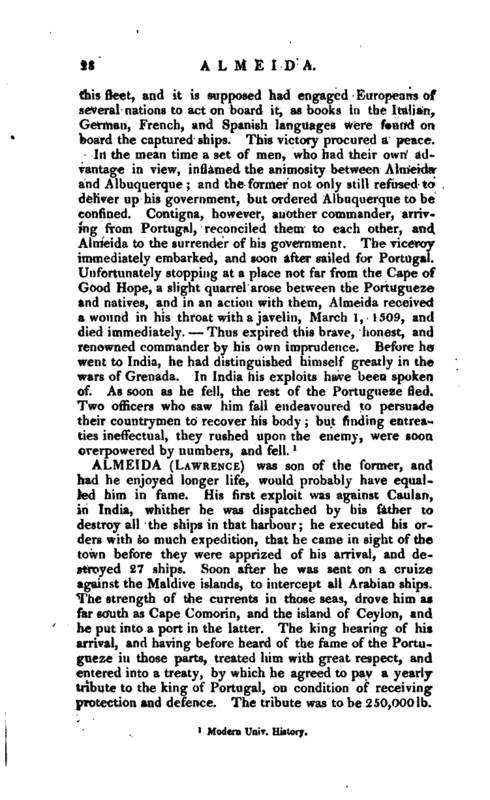 ing this, the exploits of the latter drew the attention of the court of Portugal, and he was appointed to supersede Almeida in his viceroyship. When the order for the viceroy’s return was brought, he was employed in fitting out a fleet to revenge the death of his son. This furnished him with an excuse for not delivering up his government; and he sailed on an expedition to Dabul, landed there, defeated the enemy, and made a most dreadful slaughter, not sparing even the infants. The next day the city was given up to be plundered, and afterwards burned. Thi& was the fate of many other places on these shores. He then cruized along the coast until he fell in with the enemy’s fleet, and engaged and totally defeated it, killing 4000 men. The sultan had taken great pains in fitting out | this fleet, and it is supposed had engaged Europeans of several nations to act on board it, as books in the Italian, German, French, and Spanish languages were found on board the captured ships. This victory procured a peace.